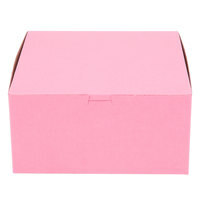 Your trendy bakery can deliver fresh baked goods in style with these glamorous pink 10" x 10" x 5" cake / bakery boxes! Their bold, pink exteriors are complemented by subtle natural brown interiors for a dramatic look that's bursting with personality. Great for packaging cakes and cupcakes for bridal showers, and any type of celebration, these chic boxes add a little pizzazz! Who wouldn't be happy to get a pink box full of sweet treats!?! The perfect shade of pink adds a nice touch when handing my cakes over to my customers. Nice size, ship well, very versatile. The only reason I gave them a 4 instead of a 5 is I wish they were greaseproof and sturdier. absolutely love the pink boxes! They are very sturdy and work great for single or even tiered cakes if you cut the top off. They are also very easy to assemble. Great price for wonderful boxes. In addition to use this boxes for cakes, cakepops, cookies and other treats, I also use these boxes to transport my toppers. Thank you! The 10 by 10 by 5 boxes are a good size! Perfect for half a dozen cinnamon rolls which is what I most commonly use these for. Very attract product that looks professional. They Work well and assemble easily. Paper felt thinner then i remembered but they were still sturdy enough to hold my cakes. The majority of my cakes are 1-4 inches taller then these boxes, but i just tape each side at an angle for the tall cakes. Great value, and the pink matches our bakery perfectly. These boxes are adorable and super useful. They work best when you pinch the corners after you've assembled them. Not the best at being water/grease proof but still the best boxes I've ever used. These are perfect for my growing custom cake business. My customers love the color and they make me stand out from the white boxes of my competitors. They are sturdy and easy to put together and hold up well even for heavier cakes. These box being a personal touch if you’re gifting or selling treats. The color is so pretty and it’s super sturdy and the material is thick so it can carry a lot. This is a must and every backer should have these boxes. My customers loves my signature boxes. Perfect addition to our new cake catering venture. They are easy to assemble and send the perfect message to our clients. They hold the cakes well and are durable. These boxes are great quality, love that they are recyclable! And they come at a third of the price as my big brand distributor. Our customers love the pink box. This cake box is the perfect size for holding larger three layer cakes. They are also very sturdy and dependable for transporting cakes for some distance. I absolutely live these boxes. They go very well with my color scheme. More importantly whenever I arrive with a pink box, heads turn. My customers have often commented on the beauty of the boxes and how they feel so good carrying them into an event. I do wish they were a little sturdier. If you don’t get the front connected just right, the box can shift when you pick it up. thin cardoard, didnt hold a dozen croissants, it get dirty quickly and not really easy to assemble. i wouldnt buy again. it may hold ligther products but wasnt good for my bakery. These pink boxes are cute but they are not hot pink color. They are also not grease froof and a bit more flimsy and easily stained than the white bakery boxes. This is a really nice bakery box to grab donuts in. They hold up well. They arrive flat so they're easy to store and they're easy to assemble. I am in love with these boxes. The nice bright pink color ties in great with my company logo and I add a nice bright yellow ribbon to finish it off. These boxes are perfect for my 8-9" cakes on a 10" board! The color is charming and they are very easy to put together! I highly recommend these for a nice professional presentation! These boxes are perfect to stand out from the plain white bakery boxes that most people use. The size is great for basic single tiered cakes. I also use these to box my decorated cookies. These 10" x 10" x 5" Pink Cake / Bakery Box - 100 / Bundle are perfect and the pink color is adorable! I just love them! I am in love with these beautiful pink cake boxes. I fit a 10 inch cake circle with ease and fits a 9inch cake with space to spare. I love it! These are my go-to cake boxes for all my cakes. I love the pink color and they are just what I need. Also, the best pricing I could find was on this website for this style box. These boxes are fantastic! I use this and the 8" x 8" x 5" boxes the most and they make for a professional presentation for my licensed home bakery. I had labels printed and affix those to the top/front to complete the look. Will definitely be purchasing more when I finish the bundle I've got! I have to say I LOVE these boxes! The quality and construction is nice and heavy and the price for these are fantastic! Perfect for what I use them for, cakes & cookies. I love these pink cake boxes! They are the face of my business because not many places utilize pink boxes and it lets my business stand out. These cute cake boxes are wonderful. Love the pink color. They are sturdy enough to hold my 9 inch cakes. I tape two of them together to hold my two tiered cakes. Cardboard is just thick enough. Solid construction. Clean sophisticated look. It's definitely a step up from boring white boxes that can be found locally, and they are much more affordable! These boxes are amazing. They are heavy duty and easy to assemble. The color is a medium pink that is just perfect. Perfect boxes for my cheesecakes. All my customers just love them! Thanks for a great product!! It is so hard to find the 10x10x5 cake boxes in New York City. All I seem to find were the 10x10x51/2 or 10x10x6 but the half inch to an inch more is too high for my needs (small apartment refrigerators) and the webstaurant store always has this size in stock which I am very happy about. Also, I can get my order filled and shipped very quickly. Pink Cake boxes are super cute! holds 10 inch size cakes. need to have a good base for support. but these definitely are worth the price. We love the color. it helps us to stand out as we showcase our beautiful desserts. The dimensions are perfect for our 9" cakes, pies and cheesecakes. I really love these ten by ten boxes. Especially the pink ones! They definitely hold the heavier cakes too. I usually have eight by eight and ten by ten cakes so I just go with these. I love these pink bakery boxes. They are very sturdy and affordable. The color gives my business a little extra flair and all my customers have loved them. I've been looking for pink cake boxes for the longest time, and I absolutely love the look of these. They give a pop of color to all my cakes, and the size is perfect for 8" and 9" cakes. These boxes are also nice and sturdy. Love the color of these boxes! They are very easy to put together. I get a lot of compliments regarding these boxes. The are the perfect size for my tall cakes! These boxes are an excellent product, they put together easily, and are very professional looking. They are very sturdy and don't need extra support. I would definately recommend them.